The community of Mduku village is among many who are benefiting from Conservation Corporation Africa. The corporation operates many game reserves and lodges countrywide. Through its community development programme called Africa Foundation, it has already empowered over 60 000 people by bringing technology, health services and education closer to rural communities. The provinces where it operates include Mpumalanga, Limpopo, North West and KwaZulu-Natal. To give back to the community, the foundation, together with the local tribal authorities, identifies community needs relating to health, education, technology and job creation. In Mduku, the foundation identified the need for modern communication technology like fax and photocopy machines, as well as access to the Internet. They also saw the need for pre-school centres and clinics, a bursary scheme for further studies, and an art and craft market to sell goods made by the community. A committee, which includes members of the community and the corporation, co-ordinates the projects. In Mduku, the projects are run by the corporation's local Phinda Game Reserve. They have already built several pre-schools and clinics and are helping community artists to sell their crafts at the lodge. They have also turned an abandoned road construction campsite into a computer school, Internet café and health unit. The campsite was donated to the community after the road construction was completed. The centre is called Mduku Dev Centre. 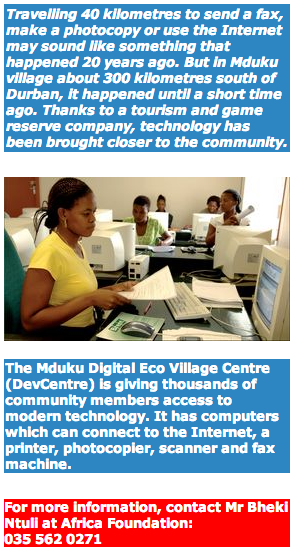 Dev Centre is short for Digital Eco Village Centre. The idea was taken from Boston in America, where they sold products made in the villages through the Internet. 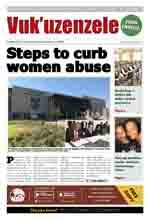 The centre is fully supported by the local municipality of Hluhluwe and the provincial Department of Health. Africa Foundation Development Manager, Isaac Tembe, said when they took the idea (DevCentre) they focused on what was important in their areas. "We wanted to bridge the technology gap in communities. At Mduku, people used to travel about 40 kilometres to the nearest town just to fax or make photocopies." During Vuk'uzenzele's visit, the Dev Centre was starting a health unit, which focuses on HIV and Aids issues and healthy eating habits. Tembe said many people in the community were infected with and affected by HIV and Aids. He said the people knew very little about the disease and how to live with it. "Many are still shy and afraid to disclose and rather prefer to die in hiding," he said. "With the new health unit, we want to educate people about HIV and Aids and encourage them to test, use condoms, disclose and live positively," he said. This will include healthy eating habits and exercise.